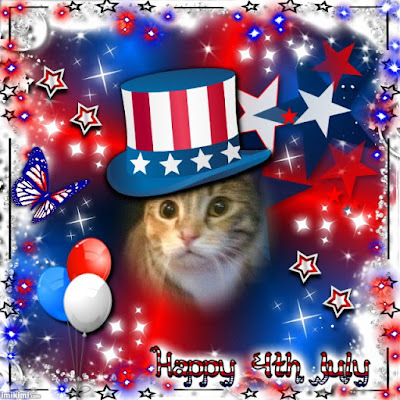 I could not resist sneaking in here and posting one more 4th of July pic. Of ME, natch. Carol insisted on putting together a slideshow of OTHER cats, so you can see why I want to grab the spotlight again.This cool graphic is from Imikimi and so is Paprika's. She insisted on sneaking in here. You ladies look VERY nicely "turned out" for July 4th! HAPPY INDEPENDENCE DAY! What great patriotic pics! We love them! You look so very nice Peaches. 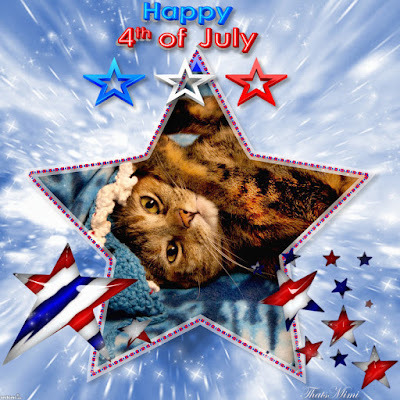 We purr that you two have a wonderful 4th of July.